On January 4, 1974, the gilded grasshopper weathervane atop Faneuil Hall was stolen. The theft made national headlines. During the oil crisis and subsequent recession of 1974-75, historic treasures and art thefts significantly increased. It was believed that the stolen weathervane would fetch hundreds of thousands of dollars on the black market at the time. The police initially stated that the four foot long, eighty pound copper grasshopper was probably stolen with the use of a helicopter. The publicity of the Faneuil Hall theft actually helped to recover other famous weathervanes in the country that were missing or stolen at that time. A few days after the theft, a man was arrested in Abington on an unrelated crime. He tried to negotiate a plea bargain by stating that he knew the whereabouts of the missing weathervane. His lawyer was interviewed by Boston Police detective Paul Carroll. It turned out that the man was a former steeplejack, and had previously worked on Faneuil Hall in 1967. 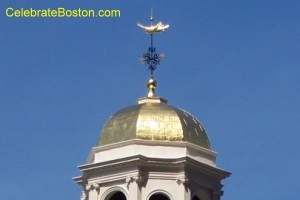 The grasshopper-napper or vane-napper, had actually just hidden the historic weathervane in the cupola of Faneuil Hall, with the presumed intention of holding it for ransom. It was recovered on about January 12. The vane was damaged during the theft, with parts of it recovered from a storage locker at the old Park Square bus terminal. The famous grasshopper was repaired, and placed back on its 80-foot high perch atop Faneuil Hall on July 27, 1974.